I have really, really neglected this blog for a long time. Let me see if I can go back to food blogging again. One needs passion to write a food blog or else it comes out dry and stale like a piece of overnight roti canai. You just do not want to chew on that, do you? Before I go on, let me tell you about some scam going on. Apparently, some folks are going around telling innocent, gullible people that they can make tonnes of up money by putting food blogs. These people were conned and had to part with their hard earned money costing up to RM1K and above for a stupid site. People asked me about my opinion on their supposedly to get rich very quickly food blog. I do not have the heart to tell them that they had been conned. I do not make money from my food blogs simply because I have nice photos or nice recipes. I put in a lot of hard work, skills, passion and time. I invest in good camera, cooking utensils and also eat a lot at my own expenses. One cannot have a food blog by buying a recipe book, modify a bit of the recipe and post it. Anyway…..today I had Penang Road famous Teochew cendol and I must say that the quality has dropped. I like red beans in my cendol, not large kidney beans. Nowadays, the hawkers are getting lazy. They do not boil their own tiny red beans anymore. They buy those canned kidney beans and hope to pass it off as traditional cendol. It is not the same at all. The other thing that I hate about some cendol is how those tiny green mungbean strips hardened when it is soaked in ice. Come on, how can…..cendol is supposed to be soft, not frozen. I don’t know what they put in the greenish wormish strips. So, yeah, the cendol is not so nice anymore. 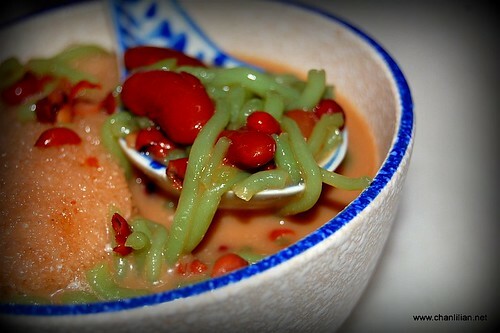 In fact, I cannot find a cendol stall selling cendol with tiny red beans. The only one left at Swatow Lane (the old coffee shop which didn’t move to New World Park) also converted to kidney beans. Blek. Wah …. no wonder so many new food blogs came out lately. They think to maintain a food blog is easy and making good money. We invest our time, money, dedication to write and passion behind it without them knowing. 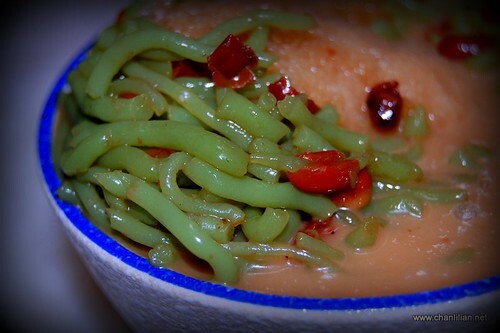 Agree with you nice bowl of cendol always taste better with red beans and not the kidney type. Nice to have you back again writing about Penang food! Cendol is one of my favorite foods but it’s been some time since I was in Penang and able to get a bowl. Kidney beans may be red but they are entirely the wrong texture and taste for cendol. Using a canned product for something that should be as fresh as cendol is very sad. Its not so easy to keep a blog up and alive so much so for a food blog if the passion is not there. Looking back at my blog I see all the ‘rojak’ there with some passion for food within my means and effort put in. Bout the scam part, I totally agree with you that creating AND maintaining a good blog is not an easy task at all… People still believe that money falls from the skies don’t they? Ooh I know a really good cendol place at Hillside. It’s the hawker centre opposite Tanjung Country Club. The stall’s pretty easy to find, with a string of colourful lights around it. While serving the net I came across this blog and happy to be a part of this blog. Oh talking about food…I don’t really see or taste an quality food in street stalls like those days. Even the mamak mee or chendol or for a matter nasi kandar has lost its original taste and quality. Talk about quality it’s totally out . Thou not all , to say there are very few old days tasty food in certain state which the owner maitains the taste. Like to share this -…to taste penang asam laksa in K.L…go to Petaling street run by few sister’s. The taste is still the same as I used to eat during my secondary school day’s – this I called quality food. Its like 15 yrs ago…now the taste is still the same …The stalls is located in the middle of the shopping rows.